One of the great joys throughout my career has been my involvement with Special Olympics and particularly my work with Peter Wheeler and Kirsten Seckler directing the documentation teams at the biennial World Games. I’ve managed teams of students and professionals numbering from six to more than 300 for many decades. The 2017 Winter World Games were held in late March in Austria and after a great couple of weeks with Deborah, Nick, Trevor, Jim, Danny and Josh, Cynny and I enjoyed a delayed spring break with a quick road trip around the Iberian Peninsula. Lisbon was our starting and ending destination, as it was our connecting city for flights back to Miami. From there, we headed south to Estói, wanting to avoid the touristy seaport city of Faro, but hoping to visit the sea caves in the Parque Natural da Ria Formosa. Estoi is the site of the Palácio de Estoi, a restored Rococo building constructed in the late 19th century that has been restored as a luxury hotel. Not needing a palace, we stayed at the family-owned Casa de Estoi, a maze of an early 20th century manor house with six rooms, each named after flowers. The one open restaurant in town, Galeria dos Sentidos, provided a free shot glass of after-dinner port, but refused to provide tap water at dinner, insisting that we buy bottled water. We managed to get in a morning walk around Faro, but the rain and wind made venturing out to the sea caves impossible. From Estoi, we headed to Gibraltar where the weather cleared and we had a beautiful day hiking the entire Upper Rock Nature Reserve. The original plan was to take the cable car to the top and work our way down, but we had only one day on the Rock and it was the day the cable car was closed for maintenance. Since we have an aversion to group tours, we picked up the mostly useless trail maps and hiked from one end of the Rock to the other and back again. From Gibraltar we headed up to Antequera, from where we would have a morning and an evening to explore Paraje Natural Torcal de Antequera, the main destination on our trip and a must see for anyone in the area. I had aspirations of photographing the Milky Way above the craggy mountaintops, but after our initial exploration we determined that it would require spending the entire night in the park and hiking by head lamps well into the park on poorly marked trails, so that idea was quickly moved to our after retirement travel planner. There is much to see and explore in Antequera and a variety of places to enjoy Iberian ham and freshly harvested olives, including the only restaurant in Europe inside a bullring. From Antequera, we turned back toward Lisbon, stopping for an overnight in Seville and a night in Badajoz before heading home. Our biggest challenges on the trip were to enter the correct toll lanes, figuring out how to use the car elevator at the hotel in Seville, knowing what time it was and trying to stream Carolina’s NCAA tournament basketball games. Daylight savings time in Europe begins on March 26, not on March 12 like in the U.S. and Spain and Portugal are in different time zones, so we were often living an hour in the past or future. 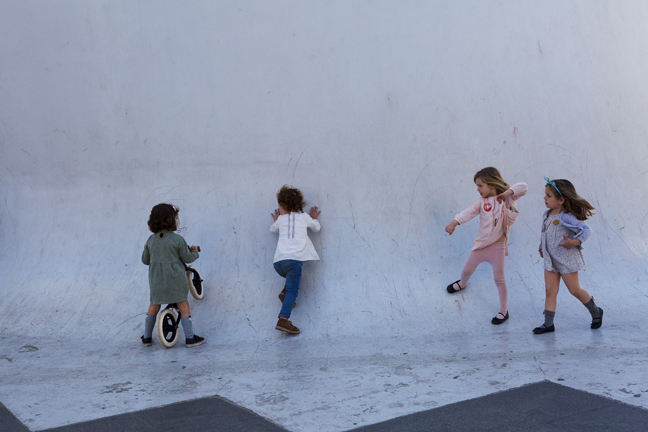 That combined with the Spaniards' penchant for starting lunch at 3 p.m. and dinner at 10 p.m. made scheduling interesting. Poor Internet, the fact that you actually can’t stream NCAA tournament games in Europe without the hassle of a paid VPN and that most of Carolina’s games started at 2 or 3 a.m. was not conducive to normal sleep cycles. We missed parts of most of the games, but all’s well that ends well. 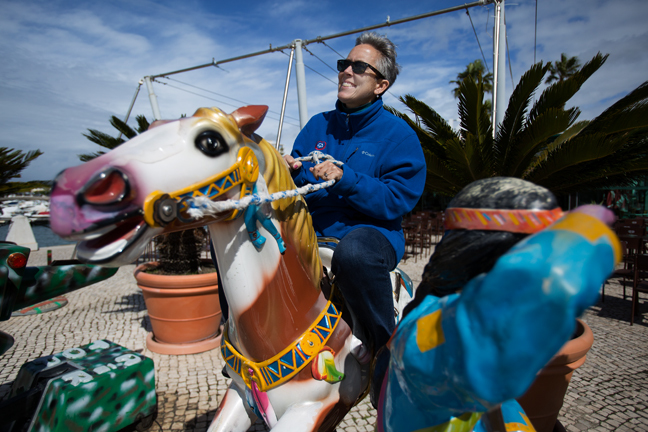 On a cool and rainy morning, Cynny braves the elements while taming a rare American Paint Horse in Faro, the southernmost city in the Algarve region of southern Portugal. 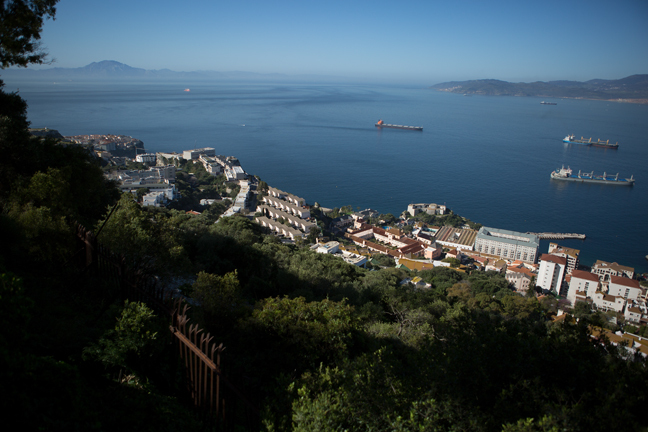 The Strait of Gibraltar connects the Atlantic Ocean to the Mediterranean Sea and separates Gibraltar from Morocco and Ceuta. Cueta is a Spanish autonomous city on the north coast of Africa. Gibraltar is a 2.6 square mile British Overseas Territory on the southern end of the Iberian Peninsula. The British are responsible for the Territory’s foreign affairs and defense while Gibraltar manages its own local affairs. Citizens overwhelmingly rejected proposals for Spanish sovereignty in 1969 and again in 2002. We were on Gibraltar on March 28, 2017, the one day when the cable car to the Upper Rock Nature Reserve was closed for maintenance. Therefore, we chose to hike to the top via the steep Mediterranean Steps, a flight of uneven steps cut into the limestone. 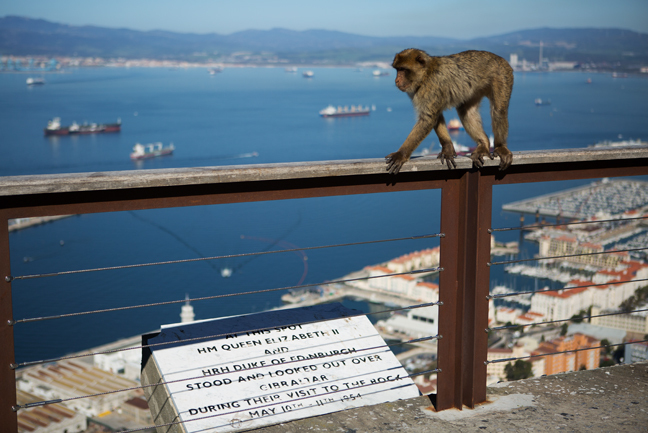 The Steps pass through Barbary Macaque habitats and it took some negotiations to convince them to share the steps. 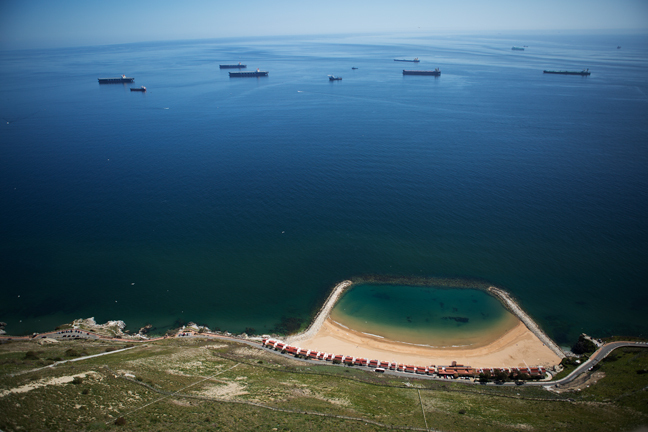 From the top, there is a nice view of Sandy Bay Beach refurbished in 2014 with approximately 50,000 tons of sand imported from Layounne in the Western Sahara. The Gibraltar Barbary Macaques are actually stubby-tailed monkeys. The population is the only such population outside of Northern Africa and the only population of wild monkeys in Europe. They are managed by the Gibraltar Ornithological and Natural History Society and receive daily rations of vegetables and fruit to supplement their natural diet and to try to keep them from harassing tourists for food. Each animal has a microchip and a tattoo for identification. Population control is an essential and sometimes controversial part of managing the colony. 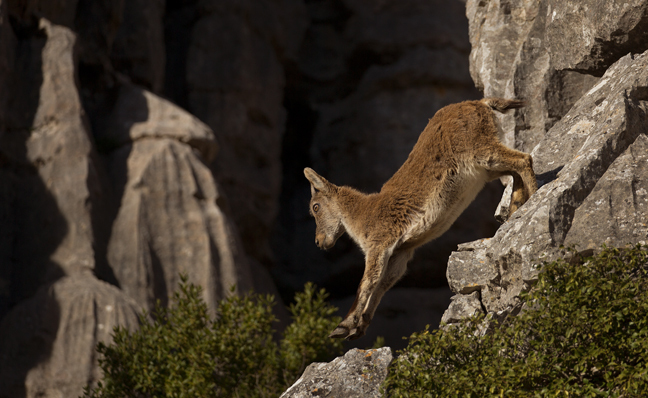 In 2008, the government culled 25 monkeys that had moved into the tourist areas of Catalan Bay and Sandy Bay and more recently problem monkeys were shipped to North Africa and a Scottish safari park. 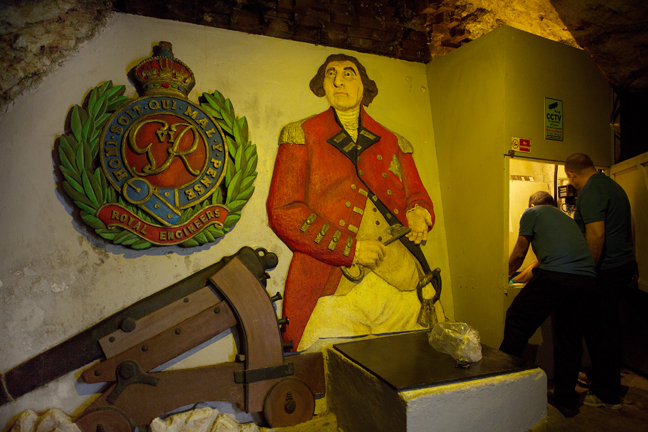 The British dug the Great Siege Tunnels from solid limestone during the Great Siege of Gibraltar at the end of the 18th century. From July 1779 to February 1783, France and Spain attempted to capture Gibraltar from Great Britain while they were engaged in the American Revolution. Guns were placed along the north face of The Rock to provide cover for troops fighting for the disputed marshy isthmus immediately to the north. 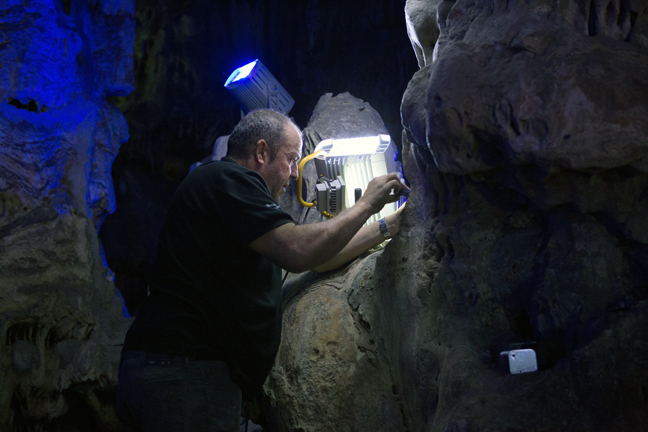 Today, the tunnels are lit and are a major tourist attraction. Cynny crosses the 233 ft. Windsor Bridge across a 164 ft. gorge at Royal Anglian Way in the Upper Rock Nature Reserve. The bridge opened on June 22, 2016. Because of its remote location, the bridge was constructed without the use of heavy machinery or helicopters. There is an alternate path across the gorge for those who believe that bridges should have side walls and not sway as you cross them. 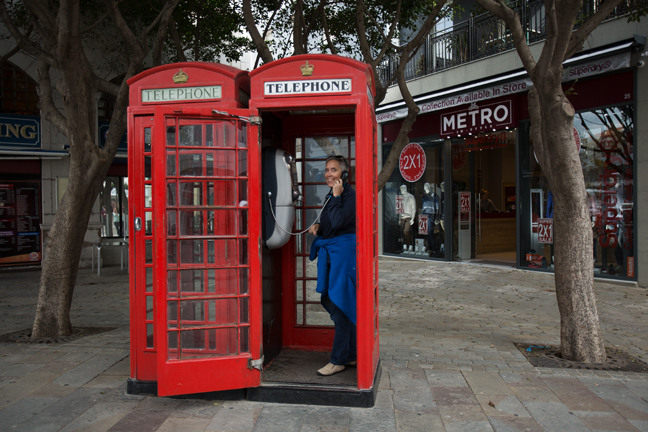 While we were in Gibraltar, British Prime Minister Theresa May triggered Article 50 in the draft negotiating guidelines for withdrawal talks. Under Article 50, it states: “After the United Kingdom leaves the union, no agreement between the EU and the United Kingdom may apply to the territory of Gibraltar without the agreement between the kingdom of Spain and the United Kingdom.” Residents of the Rock voted overwhelmingly to remain in the EU, but Britain’s decision means Gibraltar will almost certainly have to leave as well. St. Michael’s Cave is a network of limestone caves within the Upper Rock Nature Reserve on Gibraltar. The Cathedral Cavern, its largest chamber, now serves as an auditorium due to its natural acoustic properties. The cavern was at one time thought to be bottomless and to be one end of a passageway under the Strait of Gibraltar that allowed the Barbary Apes to travel from Morocco to Gibraltar. Gibraltar has long been considered to be one of the pillars of Hercules and the caverns were thought to be the Gates of Hell, an entryway to the Underworld. 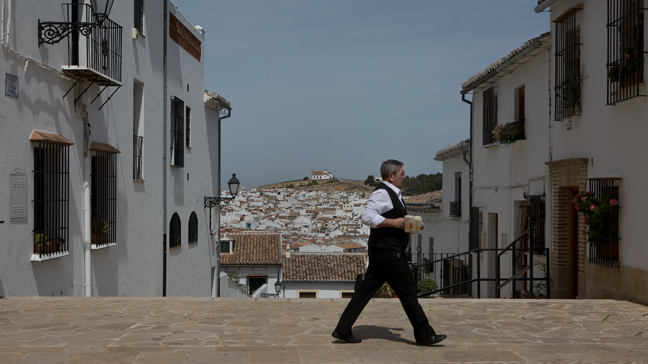 A waiter delivers cold beers to lunchtime customers at Restaurante El Escribano in the Plaza de Los Escribanos where you can tour the Alcazaba, an immense Moorish fortress and The Royal Collegiate Church of Santa María Mayor, built in the first half of the 16th century in Antequera. By the time you climb the steep steps of the Cuesta Barbacana and pass through the Arco de Los Gigantes, a cold beer is difficult to resist. 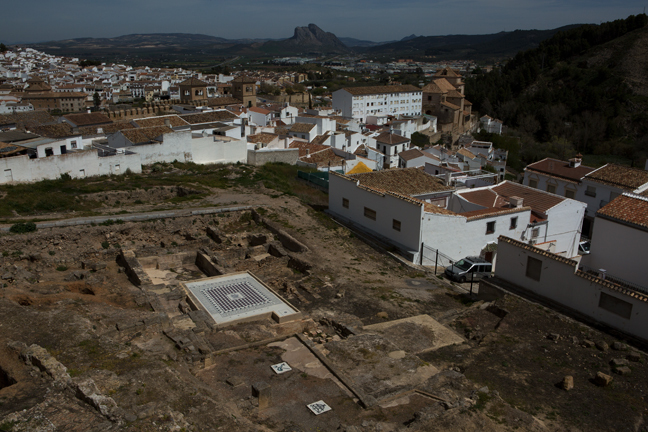 The discovery of the Roman Thermae of Santa Maria is the first proof of the location of Antikaria, the Roman city thought to be buried under the present day city of Antequera. Excavations began in 1988 and continued until 1991. The baths are thought to have been functional from the second half of the 1st century until late in the 5th century AD. There were different temperature thermal areas, characteristic of the Roman times, and a large central pool with benches embedded in the walls that was once covered with marble and attached columns. There is a large central mosaic, which has been covered for preservation that depicts a bust of Oceanus, complete with crab pincers and claws. In the background is La Peña de los Enamorados, or "The Lovers' Rock"
Decisions, decisions. 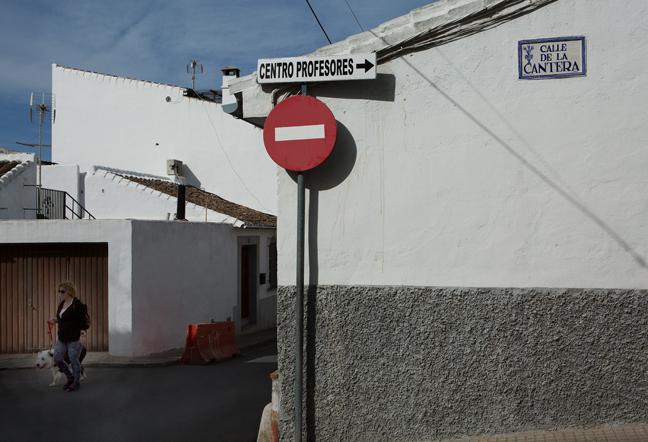 Should we follow the Old English Sheepdog or be true to the profession and head for the Centro Profesores? We chose the sheepdog. The limestone bed of the Sierra del Torca mountains, formed during the Jurassic Period 150 million years ago, was flooded by the sea of Tetis. When the mountain range emerged from the depths of the sea, it was as a highly chiseled and craggy landscape. The grey limestone was shaped by an erosive process known as karstic moulding, the chemical reaction of soluble limestone to the carbon dioxide in rainwater and ice. 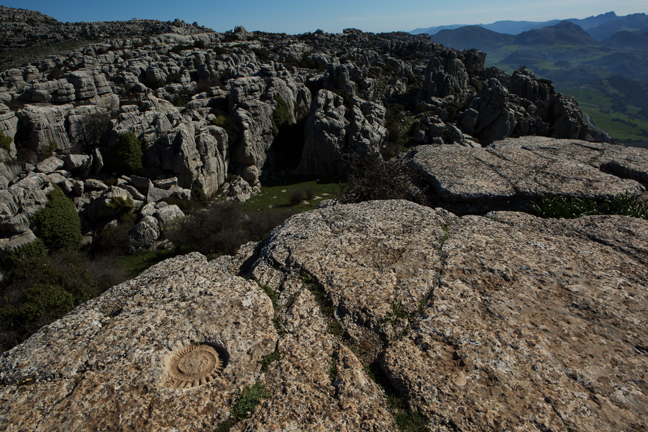 On the top of a ridge just beyond the Visitor’s Center in Torcal de Antequera you will find fossilized Ammonites. Ammonites were cephalopods that inhabited the seas from the Paleozoic to the Mesozoic Periods. They disappeared 65 million years ago. 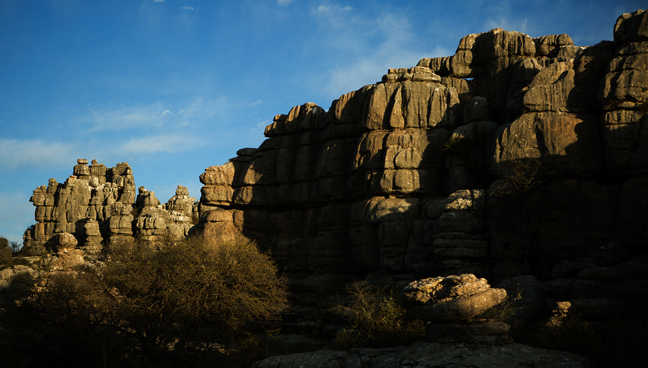 El Torcal de Antequera, located in the Sierra del Torca mountains, was designated a Natural Park Reserve in 1978 and is one of the most impressive karst landscapes in Europe. 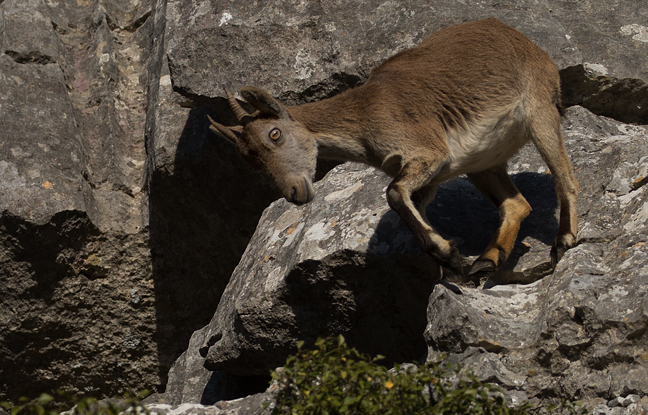 There were four subspecies of Iberian, or Spanish, Ibex, but two, the Portuguese subspecies and the Pyrenean subspecies went extinct. A clone of the Pyrenean subspecies was born in January 2009. This was the first taxon to become “un-extinct”, although the clone died a few minutes after birth. This Reserve hosts the second largest Greater Flamingo colony in Europe and is their only inland breeding site. It contains the largest natural lake in the Iberian Peninsula and provides habitat for more that 170 different avian species. In spring, thousands of flamingos congregate to reproduce, attracted by the shallow water’s high salt content. Until recent conservation efforts, salt was harvested from the lagoon, decreasing Flamingo populations. 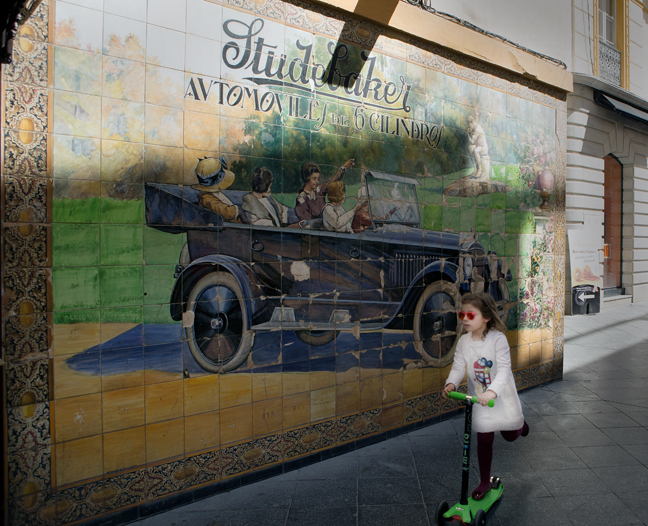 Transportation in Seville has changed since this Studebaker mural was finished in 1924. Studebaker commissioned the mural by a Señor Pinto with the tagline: “Studebaker - Automoviles de 6 Cilindros.” The mural is still in its original location, although the building that used to be occupied by the ‘El Sport’ winery now houses a jewelry store. 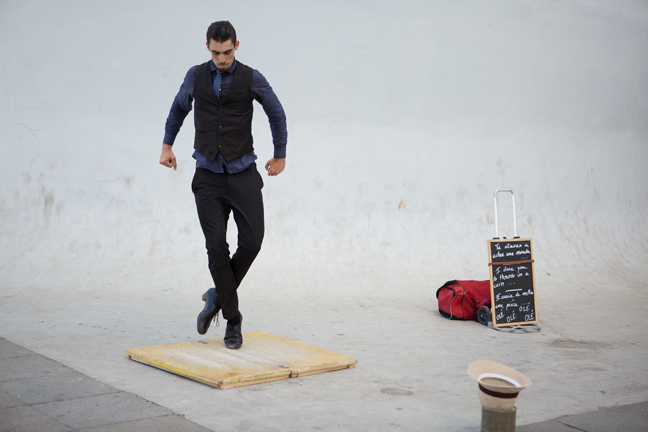 A street artist performs at the base of the Metropol Parasol in La Encarnación Square in the old quarter of Seville. A few cents buys a short Flamenco dance. If I understood the game correctly, the winner was whoever climbed highest onto the sloped pillar in La Encarnación Square in the old quarter of Seville. 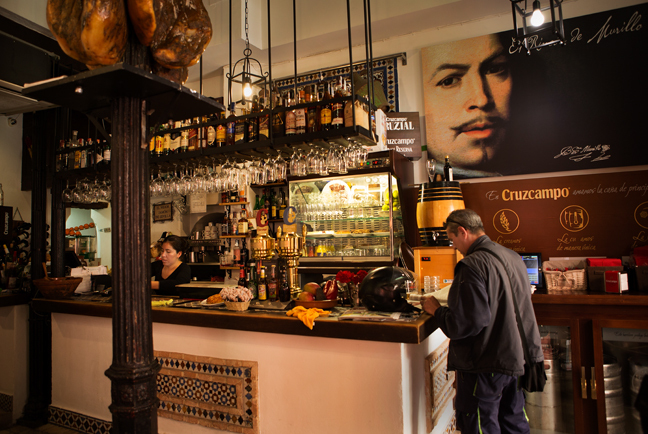 After a three mile walk to the Plaza de España, we stopped for a cold drink at a small café that featured the perfect combination of whiskey and Iberico hams hanging from the ceiling. A woman pushed a stroller along Calle Suárez de Figueroa in front of the Convento de las Adoratrices in Badajoz, Spain. The Brotherhood of St. Joseph, founded in 1556, functioned from this chapel. 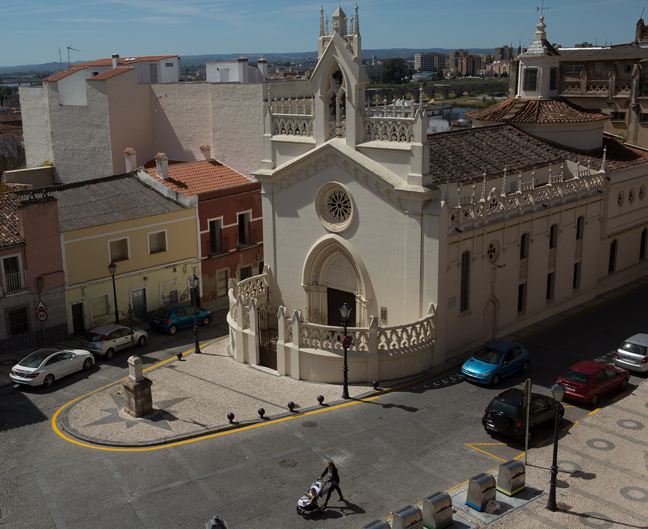 During the 19th-century War of Independence the chapel was bombed, however, it was refurbished in 1917 in the current neo-Gothic style and now houses the convent Madres Adoratrices Esclavas del Santísimo y de la Caridad. It is one of the four monasteries or convents remaining in Badajoz, of the 16 that the city once had. Badajoz has endured numerous sieges and battles throughout its history, perhaps none worse than during the Spanish Civil War when the Nationalists captured the city in the 1936 Battle of Badajoz. After the battle, more than 4,000 of the town’s inhabitants were taken to the bullring and slaughtered by machine gun fire. In 1952, The Badajoz Plan was initiated to develop the region. Hundreds of thousands of acres were irrigated and the town was provided with electricity through a series of hydroelectric dams along the Guadiana River. 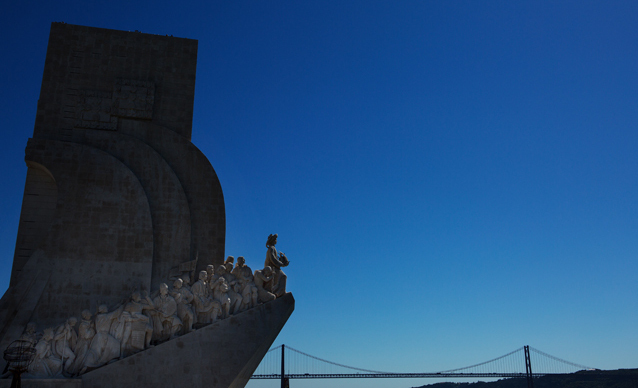 The Monument to the Discoveries, a 171-foot high monument in the shape of the prow of a ship is located on the estuary of the Tagus River in Lisbon, Portugal. On the sides of the monument are representations of 33 Portuguese explorers, scientists, artists, missionaries and cartographers, including Vasco de Gama, Ferdinand Magellan and Pedro Nunes. Behind the monument is the April 25th suspension bridge that commemorates the Portuguese Carnation Revolution of 25 April 1974 (or Cynny's birthday depending on if you believe the tourist literature or not). This bridge closely resembles the Golden Gate Bridge in San Francisco and was designed and built by the same consortium.